This request for SCPITC Training and Mentoring is your first step in ensuring that your program’s children, birth to three, have responsive, reciprocal and respectful care. Please download the application and return as per the submission instructions. We look forward to working with you. The Field Guide was created for the special individuals who spend their days nurturing and supporting the hearts, minds and bodies of our youngest citizens. It is designed for you, the infant and toddler care teacher! Your work is emotionally and physically challenging yet it is also exhilarating and rewarding. 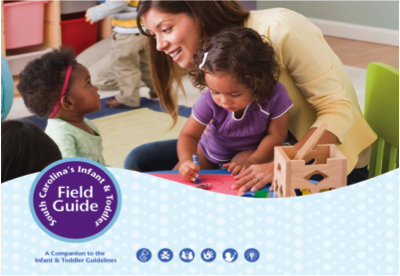 The Field Guide Training will deepen your understanding of infant and toddler development, provide you with ideas to strengthen your care teaching practices and encourage you to seek out and try new approaches.